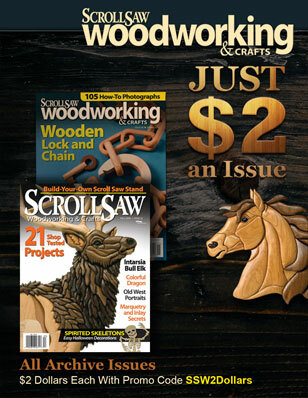 It’s time to get back to the shop with Scroll Saw Woodworking & Crafts issue #41 on newsstands now! Get a jump on your holiday projects and don’t forget to enter our new contest. The lazy days of summer have gone. The kids are back in school. It’s time to blow the dust off your scroll saw and start working on that mile long holiday gift list! 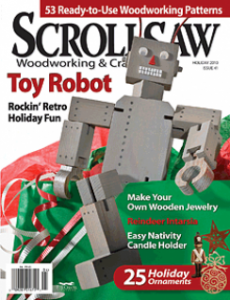 We have filled this issue with 53 ready-to-use woodworking patterns, and great projects from wooden toys, like the Rockin Retro Robot by Fred and Julie Byrne, to beautiful Wooden Jewelry by Cheryl Gustafson and festive holiday décor like the Intricate 3-D Christmas Tree by Gloria Cosgrove! Twenty-five holiday ornaments have also made their way into this issue so let’s hear those saws hum! 10th Anniversary Top 10 Winner and New Contest! Congratulations to David Ledure from Jackson, Missouri! He is the winner of our Top 10 Reason You Love to Scroll Contest. David will have plenty to read after receiving a 2-year subscription to Scroll Saw Woodworking & Crafts AND over 60 Scroll Saw Books from Fox Chapel Publishing. There were a lot of great entries and a lot of love for scrolling If you didn’t win this one, don’t worry, another contest is underway. 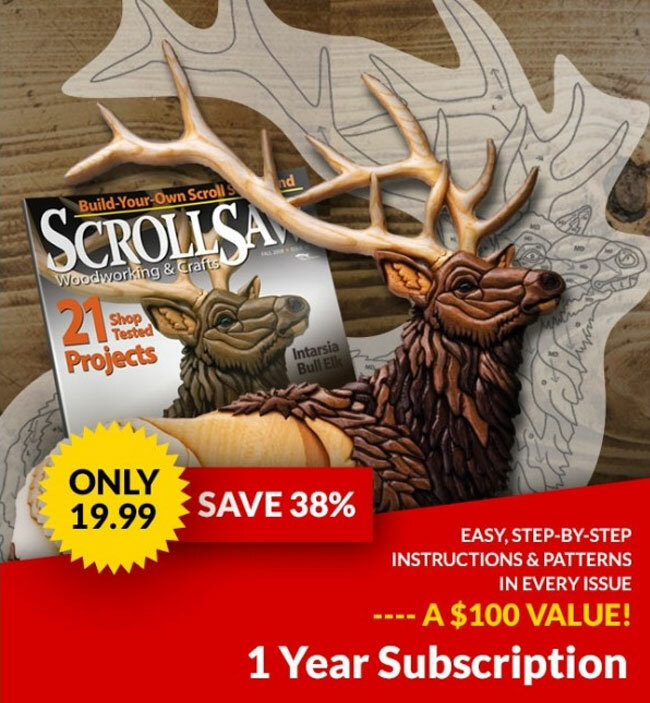 Tell us your favorite project or article from Scroll Saw Woodworking & Crafts and you’ll be entered to win a 2-year subscription and an entire Scroll Saw Library! When you do, if you live in the lower 48, you’ll get a code good for FREE SHIPPING on your next $25 or more Fox Chapel Publishing order. Judy Gale Roberts is hosting an open house on October 14 & 15, 2010 at the Roberts Studio in Seymour, Tennessee. Click here for more information. These books are filled with unique designs and would make the perfect gift for a fellow scroller or for yourself! Zany Fun with Wooden Toys! Zany Wooden Toys that Whiz, Spin, Pop, and Fly author Bob Gilsdorf is now making videos! Check out this funny video featuring a new star to the screen, Robo-Man! To all of our subscribers – be sure to check out the special offers on the book flyer that was mailed with your magazine! Not a subscriber? Get a FREE TRIAL ISSUE now!